I see others have had this problem before me so I've tried all possibilities set forth here such as installing & reinstalling and the like. Performing central analysis is just taking way too long approx 2 hours and change for the total deep scan. Nothing had changed on my system in the last few weeks. No major installs or uninstalls. Any ideas or solutions would be appreciated before I send in a ticket. Beta release v9.0.24.49 (released yesterday) appears, on my side at least, to have resolved the problem of long scan times that some of us were encountering and that seemed to begin with the consumer version 9.0.24.37 (released Nov 27th and still current). Hopefully, users encountering this problem of excessively long scan times will see it resolved when this beta version is released to consumer version. I don't see any issues on my Windows 10 x64 build 1809 so it's best to contact support. I'm honestly not sure. As you mentioned, support is the best path for getting this resolved. Sorry, @Geed, to see you have had no reply to this issue from a Forum Community member. 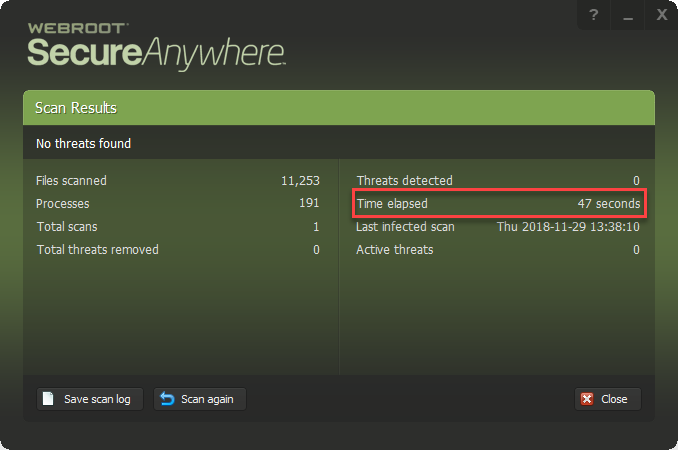 Also did you get a satisfactory response from Webroot Support? Actually, I encountered this problem about the same time as you, and as I'd never seen this before, I assumed it was a bug that would be sorted out in the next few days. I came back to the issue today and decided to do a test and, lo and behold, I still have the problem. My Windows 7 machine: this is the device I saw this problem on last month, and so I began today by testing with this machine. Scan Time: 1h2m of which 45 minutes was "Performing Central Analysis". A curiosity was that the number count of Files Scanned increased considerably during this last phase. My Windows 10 machine: the scan executed normally with a scan time of 2m36s. It is interesting that this behaviour manifests itself on my 7 and my XP but not on my 10. Could this possibly be a bug associated with Windows 7 and earlier? Or maybe 8 and earlier??? Can anyone who has a machine operating Windows 7 or earlier test to see if they have similar behaviour? And, if possible, post here to say if they are encountering similar behaviour and equally if they are not encountering this behaviour? Also, what operating system are or were you using, @Geed?